Emails from recruiters have a fairly infamous reputation in the technical community, partly because of their often spammy nature, and partly due to a lack of interest in the jobs they’re pitching. The ideal recruitment email should basically be a pitch, motivating candidates to further explore the opportunity. Engineers are extremely fortunate–we’re not generally in want of a job. To hire the best, you have to entice them away from other work. Advertising a job in country I’m not in, or for a language I don’t use. The problem stems from two very different worlds colliding, one technical, one not–there’s no wonder it’s a source of friction. Recruiters are trying to hire for jobs that they don’t understand, let alone make technical evaluations for. How are you? I just came across your profile and thought you could be a great fit for a company that I am recruiting for in San Francisco called FirstWorldProblemsFixed. Not a great start. It doesn’t look like any effort has been put into this–indeed my name seems to be the only customization in an otherwise canned email. There’s no explanation of what the company is, or why I’d want to join. We are looking for only the best to join this team. If you are a rock star ninja, please send your updated resume to me and let me know when you have some time for a quick chat so I can tell you more. If the recruiter had done their homework, they’d just look at my work online rather than asking for a resume. Indeed, I don’t even have a resume - an active GitHub account should be enough for most programming jobs. Also, what exactly is a rock star ninja? If you’re not interested, could you please share the open job on your channels anyways, mention it to your RoR friends, that would be so cool, thank you! And they finish with a desperate plea to spam all my other friends. Clearly this particular example is a bit of a straw man, and there are certainly better emails from recruiters. However I’m sure we can agree that the general trend is pretty abysmal. The reality is that if you’re cold emailing a candidate you’re already at a big disadvantage. Referrals are the best method of recruiting bar none. Take advantage of your company’s combined social network, a short email from a founder or engineer will do wonders. 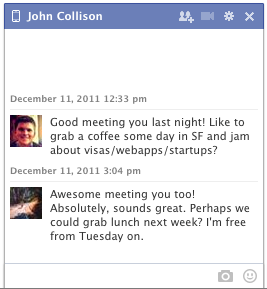 For example, here’s the Facebook message I got from John which ultimately led to me leaving Twitter for Stripe. It’s short, to the point, and referral based (a mutual friend introduced us at a party). I’ve been working on a little tool to ‘lint’ recruiting emails, running them through a number of rules to try and provide feedback on how to improve them. It’s by no means fool proof, but does provide an effective first countermeasure against poor recruitment emails. The code behind it is completely open source, and feel free to amend or improve the rules as you see fit.